For those of you working over the summer, I’ve been brainstorming some fun thematic speech lessons. One of the schools I work in over the summer selects a theme for each classroom, ranging from outer space, countries, to ocean animals, etc. Bouncing ideas off of the teachers you work with is a great way to find themes the whole team can collaborate on. Fun is the name of the game in summer school and there are so many ways to work on language and social skills while having fun. Involve your students in gardening activities. There are many ways to embed linguistic concepts into lessons around this theme. You can easily work on colors, numbers, food items, farming vocabulary, weather, and animal or plant vocabulary. Taking the students to a local famer’s market or farm would be a great field trip. If possible, start a small garden or plant seeds in the classroom. Gardening can cover concepts across the curriculum; including science, math, and daily living skills (have students practice measuring dirt or water). Students can also learn about recycling. Use recycled material to plant seeds in and have students brainstorm ways to recycle. These are great opportunities for hands on learning. Students probably see beach themed lessons and activities every summer. Why not freshen up this idea by focusing on less talked about aspects of the beach? Look at oceans around the world, lighthouses, or deep sea animals. Students can learn about various animals such as whales, sharks, squids, and many more. Lessons can include researching these animals and writing reports for more advanced students or answering WH questions for lower levels. Another focus could be on lighthouses. Students can pick an area and discover facts about lighthouses, such as where they are and what they were used for. Additional beach themed ideas are summer activities, such as kayaking, water skiing, and sail boating. These lessons open the door for many fun craft, computer, and sensory activities to accompany learning and language goals. I like to have my students write small reports and then present them to the class. This way they get practice using the computer to find information and work on the skills of communicating that information to others. One of the classes I treat in keeps a tent in the room as a break area. When students need a break from sensory stimuli they go into the dark tent to relax. Having the tent led to the classroom teacher and I deciding to plan a camping unit. I used the tent for social and play lessons and it was so much fun. We sang at pretend camp fires, “cooked” marshmallows (held already microwaved marshmallows over a pretend fire), and looked at the “stars” (glow in the dark stars that hang from the ceiling). This lends itself easily to cooking activities such as making s’mores. For students working on language – discuss vocabulary such as places to camp, what you bring to camp, and what you eat when camping. Additional skills to target are critical thinking/organization/problem solving skills. Ask “What do you need to bring on a camping trip or what do you do if you forget a map? How can you plan for a camping trip?” If this theme can fit into your summer lessons try it out and see how much fun it is. This theme is extremely versatile. Have students choose a destination and learn about new places. Students can look into what season is it in different areas, famous sites, and how they would travel there. Utilize technology when you can. Students can use various apps and websites to plan a trip and research different locations. For even more fun, add in cooking activities where language, social, and daily living skills can be easily addressed. Another fun activity is pretending to go on a trip and write postcards to family members and friends. Students can learn about new or different types of exercise each week. You could highlight trendy exercises such as Yoga, Zumba, or Pilates or stick to more basic ideas such as karate, ballet, or hiking. Students can learn about these exercises and then try them out. A visual such as video clips will allow the group to see the movements. The adult leading the group may have to modify the actual exercise based on your students’ needs, levels, and physical limitations but there are plenty of ways to do so. The adults in the room can go through movements with their students using hand over hand (or hand over legs). There are easy ways to work in language learning such as new vocabulary, writing about the exercises, and answering WH questions. You can also target social skills by learning together in a group. Added Bonus- This theme allows your kiddos to connect to their bodies and move around to exert some energy or fulfill motor stimulation! The month of August has no holidays so ask students to create their own. From National Pajama Day to Ice Cream Day, let students make up the rules and ways to celebrate their made up holidays. This is another activity that would be great as group projects and could be shared with the whole class. Students could poll each other on their favorite ideas and then graph them for math practice. This could be a one day activity or can stretch out depending on how you want to use it. 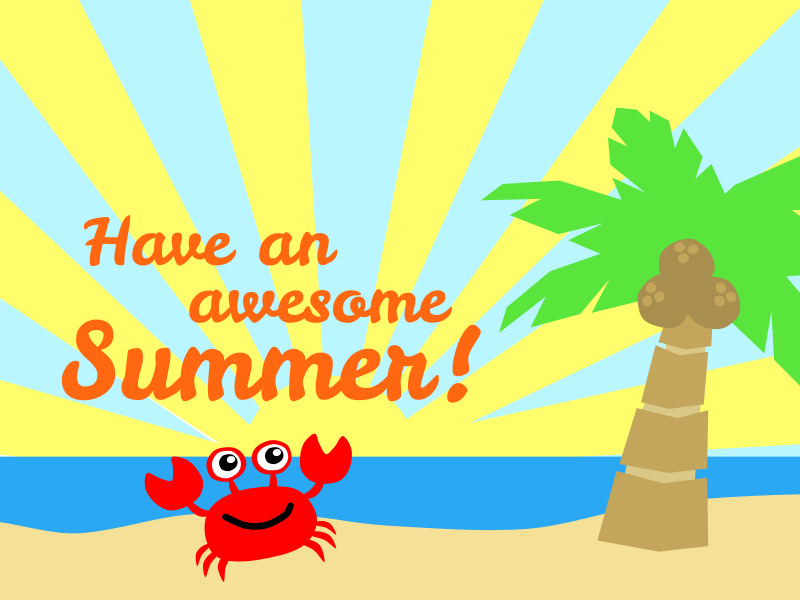 If you have any more fun summer theme ideas leave your thoughts in the comments! Sign up for our mailing list here to stay updated with our latest therapy tips, app announcements, and blog posts. Don’t forget to follow us on Twitter, Pinterest, and like us on Facebook!